There are some breakthroughs in 2014 in Bluetooth protocols and some new devices. Many new products emerged with higher Bluetooth 4.0 or 4.1 version, which requires less energy than older Bluetooth gadgets. That makes possible to bring a smaller but more powerful Bluetooth receiver. This latest Ultra-portable 2-in-1 Bluetooth receiver and transmitter adapter can be regarded as one of them. It is the most tiny apt-x receiver you can find on the market with a weight of only 19 grams. 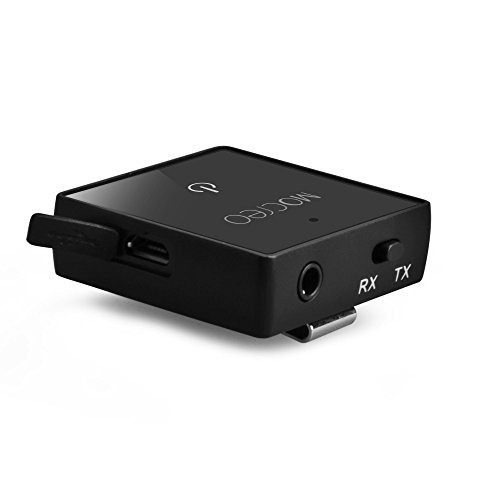 And more than just a Bluetooth music receiver it is also a Bluetooth transmitter. They also managed to make it better than others. With a 260mAh rechargeable battery it can provide 9 hour operation time in TX mode, 8 hours in RX mode and up to 200 hours standing by. It has a tiny clip with which you can carry it anywhere and anyplace you want. The adapter can be attached with your bag bands, shirt collar and other places. So the mobility of MOCREO Ultra-Portable Apt-x 2-in-1 Bluetooth Receiver Transmitter is marvelous. Although we haven’t found NFC function in this device, which can make the connection easier by just a simple touch. Considering the price, its extremely tiny size and double TX/RX mode, that is something we can compromise. In fact, it can pair with your smartphone in a minute with no complex setups required in that process. 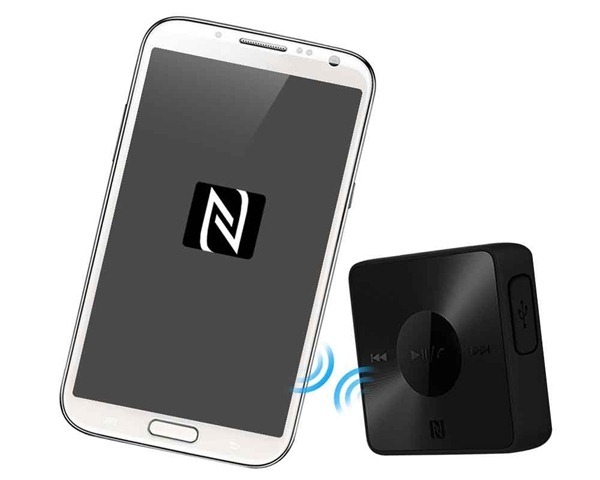 Like other Bluetooth music receiver it will automatically reconnect with the last paired device. MOCREO Bluetooth transceiver supports most of the latest audio devices,such as iPhone 6 6Plus,5 5S, Samsung, HTC, iPads, PC, tablets and more other Bluetooth devices. 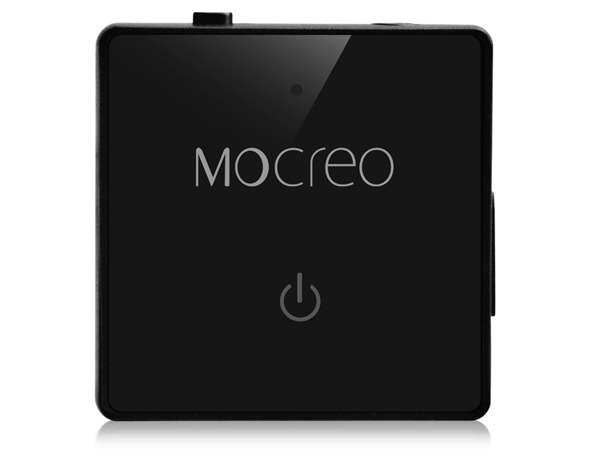 Before you connect it with any Bluetooth device, make sure your MOCREO Bluetooth transceiver is turning off. Then set the TX/RX switcher to the TX side. Turn the Bluetooth receiver on and hold standby button until the indicator on the adapter starts to flash blue and red then release it. Turn your Bluetooth headphone or speaker on. 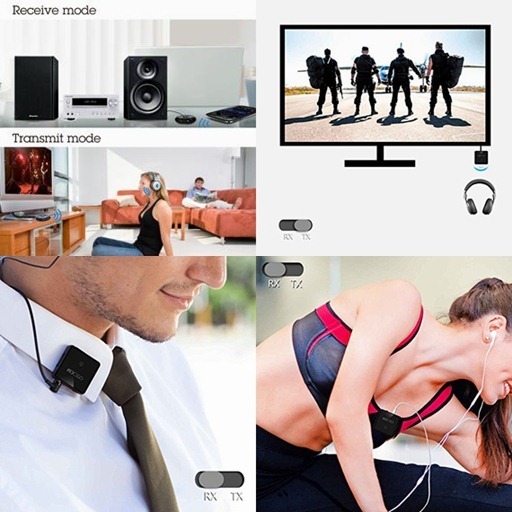 Connection will be established within seconds.With that you can listen to your non-Bluetooth tv with your Bluetooth Headphones. If you want to use it as a Bluetooth receiver just switch it to the RX side and turn it on. Then on your source device like your phone or ipad, search for newly coming Bluetooth devices your MOCREO will show up as "MOCREO TR201". Then you could connect it with your phone. Further steps are virtually the same as you have done with the TX mode. The most amazing reason I want to have this is 2 transceivers can pair to form a wireless system to enable any of your old traditional audio system into the new wireless era with a high bitrates apt-X codec. You can use one on TX hooked to your tv and the other one on RX hooked to a regular headphone you like. There is a small, in fact very unnoticeable, lag in the audio but not enough to bother you when watching TV. However, if you have high demand for synchronization of audio and image, you need a different Bluetooth receiver that supports low latency apt-x(LL apt-X) by Avantree. They have a pro model which uses this promoted tech. It is about 10 bucks higher in price but offers less than 50 ms lag time. That will be fantastic when play video game just like what you get from a wired headphone. I have two same MOCREO Bluetooth transceiver, one is for my old Denon AV receiver, which is functioning normally for about 7 years long and still bringing very pleasant sound but lacking wireless connection, the other is for travelling and hiking. I have tested in both TX and RX mode to look at how the result will be. What is the range this can transmit? Depending on the user manual that will be 10 m for both receiving and transmitting Bluetooth signals. Nonetheless, during my test as a typical Class 2 Bluetooth product MOCREO ultra portable Bluetooth transmitter could like to transmit from an av receiver to an outside speaker about 15ft away, which is in the same floor not the same room. The connection is stable and without any dropout during my test. The battery is very reliable. After a full recharge, it would last about 5-6 hours continuously in TX mode. For me, it means the Bluetooth transceiver will bring one hour wireless music in the night for at least one week. If your music enjoying schedule is heavier than mine. You will have to plug it into the charger or switch to one without battery. Generally speaking one week one charge is fair enough for me. And I fail to mention fully recharging time is about 3 hours. As a receiver I have tested it from the basement to receive the signal from the second floor send by my notebook. The sound seems fine even at the corner of story steps. Apt-x codec delivers fully wired sound quality with an impressive dynamic range over Bluetooth way as it is intended to be. Then it turned to be choppy as soon as I step outside of this theoretical 25ft limitation. So the description of the manual is accurate about its working range. When I listen to pop music in a medium voice this Bluetooth receiver surviving for up to 6 hours. The average maximum charging time is approximately 3 hours. Standby time is up to 200 hours. I did not pay more attention to that feature, but other customers confirmed that number. As mentioned before these two devices can be hooked up to form a wireless transmission system I linked one up to my LG HDTV and the other with my wired headphones and they paired up easily. The most amazing reason to have these 2 set of this transceiver is that you can form a wireless system that can enable any of your old traditional audio system into the new wireless era with a high bitrates apt-X codec. 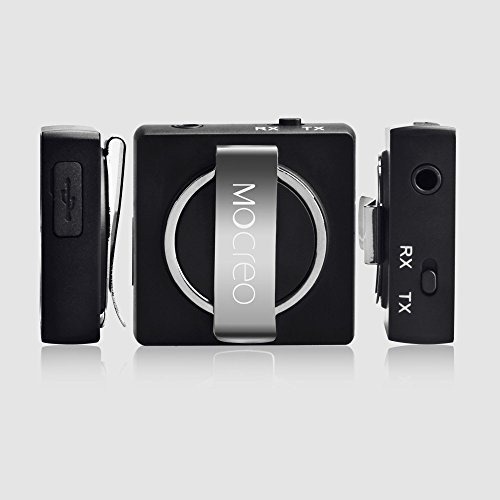 The device by MOCREO is in portable,small,easy-carry design. As a receiver, its output is very clean and crystal, powered by apt-X codec, and the background electronic noise and lag is unnoticeable. As a transmitter, it works well with a fairly long distance from 25ft and the audio quality is approved as good as receiving. Using the secure clip with your pocket or other suitable things together can keep this gadget from falling or losing. So if you want a miniature cute Bluetooth that suits anywhere the MOCREO Ultra-Portable Aptx 2-in-1 Bluetooth Receiver Transmitter Adapter is waiting there. If you have any further question about this Bluetooth transceiver. Most of your puzzles can be solved in this PDF file by the manufacturer. Not long after getting these 2 MOCREO transceivers I find that the same company brings a new version that has the latest Bluetooth 4.1, Apt-x coding and NFC at the same time. This product has taken the most advantage of the newly developed tech in Bluetooth wireless field.The only difference is it is a Bluetooth receiver not a transceiver.